I changed my focus to improving the flow of the house, and this “room” was a huge factor. I hated feeling like the master bedroom was directly off of the kitchen so I made it my mission to change that. We removed the wall separating this space from the kitchen so that the space had one fewer door. The solid exterior door was replaced with a glass one to capitalize on the mountain views (which were now exposed once more after having removed the outdoor laundry). With one door eliminated and another made to feel like a window, the only door left led to the bedroom and that wasn’t going anywhere. I needed to create a space that was appropriate near a kitchen and a bedroom. An office was the perfect solution—it created a purpose, added function and demanded a focal point which this Midcentury Modern home was clearly lusting for. A treasured wall tapestry from the Jonathan Adler sample room, given to me when I was an intern there, found its new home on the freshly painted white wall. The colors are eye catching the moment you walk in the front door, and the eye of the pattern almost seems to pull you from across the room. Anchored below is a Modern Desk with a reminiscent Midcentury white lacquer/wood finish. A funky white lamp from Z Gallerie and an authentic MCM blue desk chair that my sister saved from garbage in Wisconsin (she’s my hero) all came together to make this a smart space. Outside the new glass door, you have beautiful mountain views and ample natural light that makes the space feel more inviting. You no longer feel like you’re walking through the kitchen to get to the bedroom nor do you feel like you’re in a cramped hallway. Instead, the space flows together seamlessly and creates another functional and beautiful midcentury focal space in this home. Interested in one of the items you see in the “after” photo? This curb appeal shot doesn’t have as many options, but if you can buy it, the direct links to purchase can be found in the resource list below. Going to Palm Springs and want to rent this home? Email me at flippingdiaries@gmail.com for details! See the rest of this home’s mid mod spaces at Modernism Week! 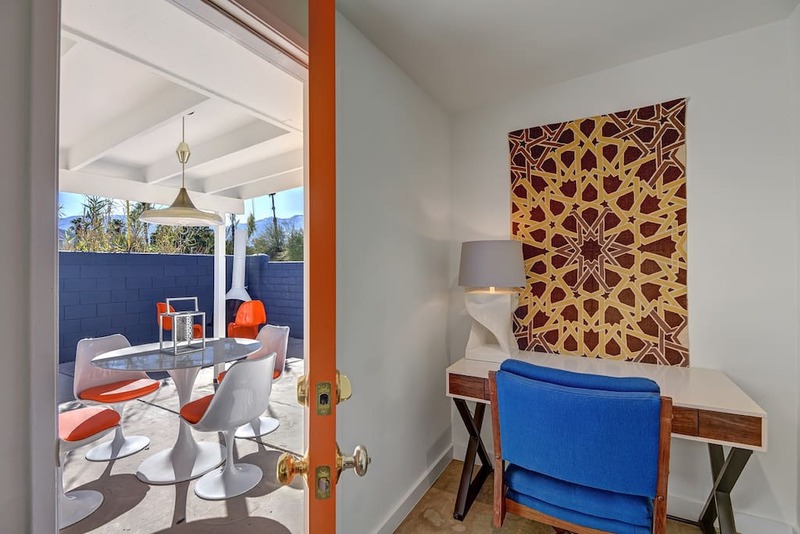 Want to tour this home and two other successfully renovated midcentury homes? Atomic Ranch is hosting a home tour during Palm Springs Modernism Week February 19 and 20. Tickets are selling fast, so be sure to secure yours today!